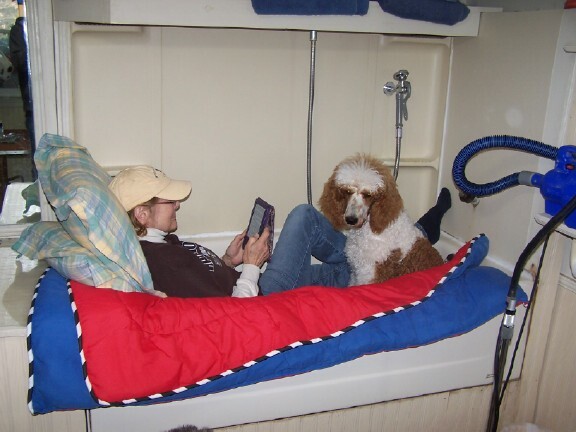 If you are a regular reader, you've seen posts in the past about my amazing friend, Poodle trainer Charlene Dunlap, of Canine Horizons. 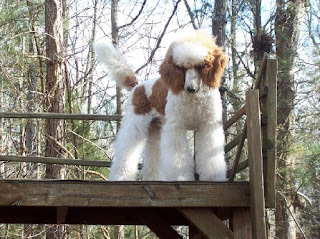 She trains her Poodles to do all types of fascinating behaviors and makes movies of them to showcase their talents. 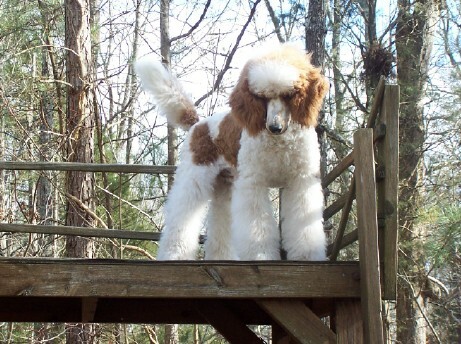 Charlene's original Canine Horizons website is a wealth of information about Poodles and dog training, and also has many clips of her dogs in action. 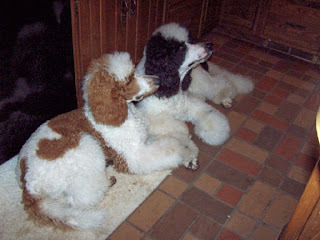 Since Poodle actors Sydney and Jyah are getting older, Charlene has added two parti boys to her crew this past year. I have greatly enjoyed keeping up with their exploits and training. Here are some pictures of Joey and me playing in the obstacle yard. 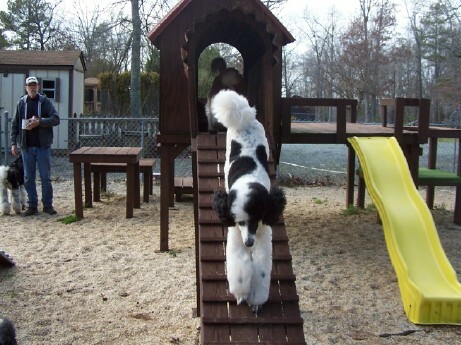 It's hard to see me coming down the ramp right behind Joey because of his tail. 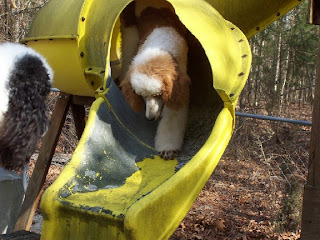 Mom was really surprised when I went up the yellow tunnel (see below right) to the top (8-feet high) all by myself and then came down it again. This is one of the last obstacles in the yard that has to be refurbished. 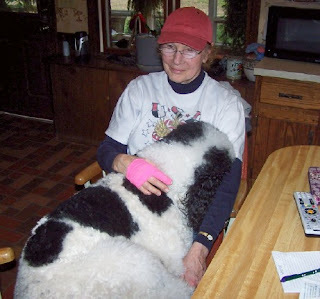 Mom sprang her right index finger - see the pink tape? -- so, she couldn't help Dad brush us out today. 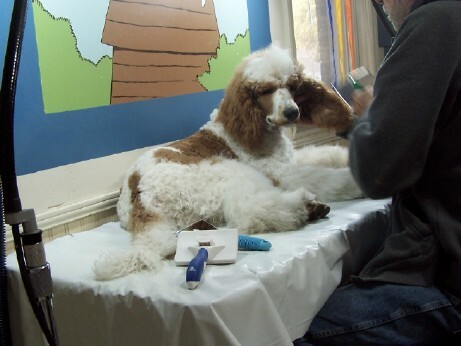 She wanted to be with us though so she made herself comfortable while Dad brushed all of us dogs. Dad ran and got the camera -- "for posterity" he said. Thank you Parti boys and friends! I hope Mommy's finger is better now. 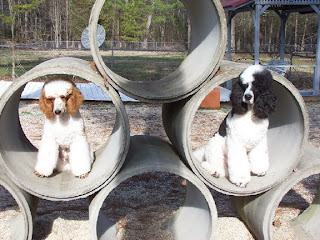 Note to readers: Unfortunately, my blog format does not do the photos justice, plus there is so much more to see on their website. You can even preview the boy's first movie--for free--on their website so take a look today: The Parti Boys Website Enjoy!